The countdown to the big fat Indian elections starting in April 2019, has begun and this poll for parliamentary seats may indeed be one of the most consequential contests seen in recent times. It has the potential to rewrite history; the very idea of India is under threat. The electorate faces, as always, an array of tantalising and challenging options, on economic policy to conduct of foreign affairs, but by far the most testing choice is likely to revolve around the country’s national identity. During the nation’s foundational stage and thereafter, there was a fair consensus on this matter but it is possible that a significant portion of the Hindus, over 900 million of them, wish to revisit this issue. Beneath all the noise and sloganeering and reductionist debates of Prime Minister Narendra Modi versus Congress party president Rahul Gandhi, the nation is at a crossroads and its citizens are clearly being asked to redefine the nation-state: Is India’s natural destiny that of a Hindu nation or is that a road to Hades? The founding fathers fearing majoritarianism had built in robust constitutional safeguards, but should Modi get another term of office as prime minister, it would be safe to conclude that a sizeable number of Hindus desire change; the bend in the river, to borrow from Naipaul, is upon us. The Ganges is possibly headed for a change in course. Undoubtedly, corruption, governance, crony capitalism, the poor record on employment generation and many such issues will figure in the voter’s mind. So will he or she weigh in on factors such as whether he or she wants a Modi, who is authoritarian but personally not corrupt? Or is Rahul in his new avatar the answer to India’s formidable challenges? Or is the ‘mahagathbandan’ (the grand alliance), and the coming together of bitter rivals, Mayawati and Akhilesh Yadav in Uttar Pradesh, the way forward? Is the Kolkata rally and a chorus of 23 parties the new wave? This shift to the Hindu right has been going on for a while. Many markers have been provided to thread this swing, but let’s analyse this churn using recent events and data: Namely, the 2014 national elections wherein Modi broke a 28-year record of electoral history. From 1989 and up until 2014, there had been a series of coalitions wherein disparate sets of parties joined the government to share the spoils of office. Modi in 2014 did not just buck this trend, but rewrote electoral politics. He turned the parliamentary election on its head by making it into a presidential type of contest, of Modi versus Rahul, and as a result became the single-most popular politician in contemporary times with a pan-India reach. A one-man orchestra though with a string quartet that can hardly be heard. 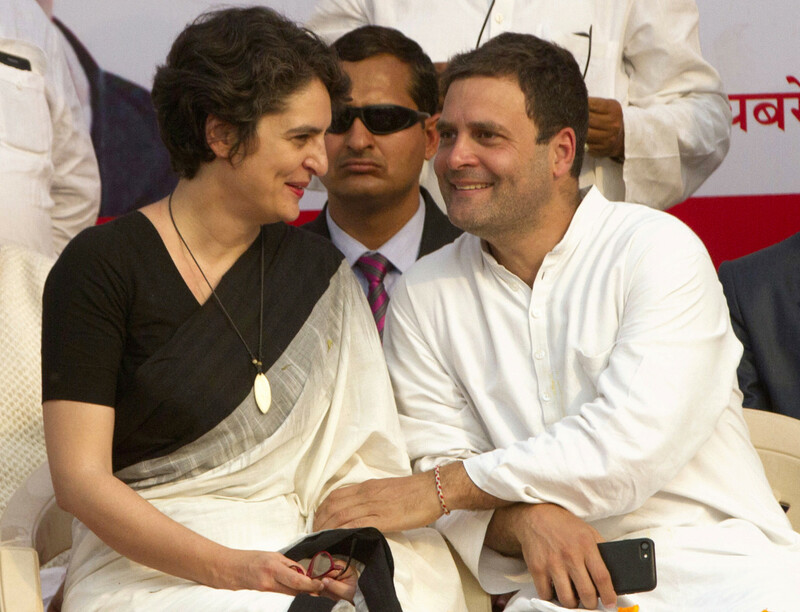 He has modelled himself on India’s iron lady, Indira Gandhi, including her authoritarian streak and the tactic of consolidating all power within her office and person. ‘Indira is India’, a slogan thoroughly discredited is back in circulation for Modi, like the Sun King Louis XIV thinks ‘I am the State’. Interestingly, despite Modi’s dominant position in public life, the electoral maths of the 2014 elections does quite add up. The Bharatiya Janata Party (BJP) under Modi in 2014 got a vote share of 31 per cent, (*38.50 per cent including its allies) — up from less than 19 per cent in 2009 — while the Indian National Congress dipped to 19 per cent from a high of 28 per cent. What is significant here is that even with the Modi wave, the non-BJP vote was more than 60 per cent. Modi was at his peak in 2014. In 2019, however, he is no longer an electoral machine that decimates the opposition. He has faltered, and may possibly be voted out. Yet, curiously, he is still the most popular politician. So should Modi become prime minster again, albeit with a weakened mandate, there is a clear message to the nation at large: The intrinsic liberal conscience of Hinduism with its philosophy of ‘live and let live’ is under siege and nativism and xenophobia have leached into its central tenets. The social disharmony seen since 2014 does not matter; the public lynchings, the forced conversions, the blatantly divisive tactics in Assam are all of no consequence. For Modi is but a symbol of this subterranean change. The famed jurist Fali Nariman said recently, if the Hindus of 2019 decide they want India to be declared a Hindu State, the minorities then, have to simply accept this. Interestingly, he also reminded his listeners that the Constitutional Assembly in 1950 voted overwhelmingly for a liberal constitution for India and this, despite some prominent Hindu right-wingers being members of the august body. The 2019 elections could well be a referendum, a mother of all battles for the soul of India. Who knows, the Ganges may yet hold its course?